When Australia landed on Indian soil for the ODI and T20 series, they were coming off a horrible one year, having won just two out of 18 games in 2018. Moreover, they had just succumbed to their first ever bilateral series defeat at home against India. The odds were heavily against the sixth-ranked team before the start of the series. The series started in expected fashion, with India winning the first two games. Australia, however, did not go down without a fight and bounced back in style to win the series by winning 3 consecutive games. En route the series victory, Australia became the first team to beat India in two consecutive ODIs in India since Pakistan in 2012-13. The selectors have had a tough time settling in on the slot for the backup wicket-keeper. Dinesh Karthik and Rishabh Pant were picked in turns to make sure both of them got enough opportunities to stake their claims for a World Cup berth. Now that India have played their last ODI before the mega event, who should make the cut? Talking about wicket-keeping, as evident from this series, Pant has a lot to improve - and no doubt he will. But taking him as a backup wicket-keeper ahead of Karthik would be foolish. 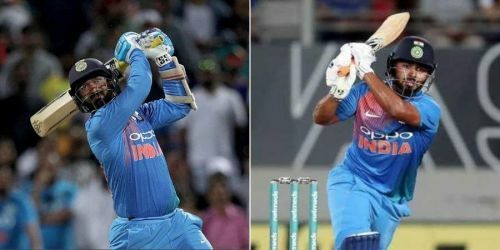 With MS Dhoni behind the stumps, Karthik or Pant might play as a pure batsman. And in that case, again, Karthik is a way better fielder than Pant. As far as batting is concerned, Pant did show glimpses of brilliance, but he still lacks the temperament to stay and finish games. No doubt he has played most of his career as a top-order batsman, but he will be given the role of a finisher or a pinch-hitter if he gets into the XI in the World Cup. With Karthik at number 6 or 7, the lower middle order looks a lot more stable. It's not that Pant cannot perform the role to perfection; it's just that Karthik's experience is something India will need more for the finisher's slot. Pant is, of course, the future of Indian cricket. But rushing him into this World Cup will not do any good, neither for him nor for the team.